Now I do not know much Lord of Tears to be completely honest, I saw it on my vast list of things to do blog posts about and thought it might be an easy post to do on a hot, lazy Sunday afternoon. Ok, now I have just watched the trailer, quite an awesome trailer it has to be said, I will include it at the bottom of the post. 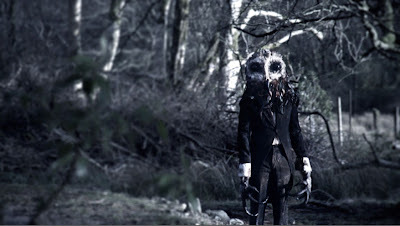 Going by the trailer it seems to be about a man haunted by a mysterious and sinister looking being dressed like a Victorian gentleman but with the head and claws of an Owl at a remote country house. If the film is directed anything like the expertly made trailer it will be a real treat as I got goosebumps (maybe owlbumps?) watching it. It is described on the kickstarter page as a Slenderman Lovecraft Supernatural Horror. I love Lovecraft tales, there are no scarier stories so am actually quite excited for this. Creator Lawrie Brewster says the tale was inspire by the Gods and monsters of ancient religions. Lord of Tears was a kickstarter project, achieving its goal after just 10 days. It is going to be shown at the San Diego Comic Fest in October and at the Bram Stoker International film festival and even has a real life Sultan as an executive producer on it! I get the vibe that this could really be something special. The Kickstarter is over but still go to the page to get some more information on it if you wish; here.